What Kind of Punched Paper & Binding Covers are Available? If you need to bind documents, but you don't have a binding punch machine, then you can use pre-punched paper and pre-punched binding covers as an alternative. They come with holes punched along the binding edge for several popular binder supplies types, so you don't have to hassle with punching them yourself. Spiral coil binding is one of the most popular ways to bind documents; people love the durability of the coil binding spines, the variety of colors and sizes, the cover-to-cover turnability, and the cool spiraled look. But spiral binding machines can be expensive, and they do take a bit of labor and time to punch pages. If you are working with low volume book binding, or want to simply produce coil bound books without the extra time needed for punching, then pre-punched paper and pre-punching report covers are a great alternative. They come with a couple different variations of punching patterns, including standard 4:1 pitch with either 43 or 44 holes, as well as with either round or oval hole shapes. The oval holes in punched pages make it easier for you to insert the binding coils, and is especially popular when working with large coils and thick books. The punched filler paper is a basic 20# bond, and can run through most regular printers and copiers. The punched binding covers come in several popular materials: clear punched covers for coil that will show your first page through, and vinyl opaque punched covers for coil that are made of a premium, heavyweight vinyl material that is most commonly used as a back cover, but can also be used on the front. Wire binding is another incredibly popular method of document binding, traditionally done with a punch machine and a wire closer. Also called twin loop or double-o wire binding, wire binding spines come in two different punching patterns: either a 3:1 or a 2:1 pitch. We keep 3:1 pitch punched clear covers in stock, which has 32 holes along the 11" binding edge. You can choose from either round or square holes; both fit perfectly with any 3:1 pitch Wire-O binding spine. We also offer the option of either a medium weight 7 mil clear punched cover, or a heavy weight 10 mil clear punched cover. Both have a glossy finish that helps enhance your printed sheets underneath, increasing contrast and making colors more vibrant. To bind the pages, just place the twin loop wires into the holes, and then place the binding spine into a wire closing unit. We have manual options or electric options for higher volume needs. These punched filler paper sheets and cover stock sheets feature 19 rectangular holes along the 11" binding edge, which is compatible with plastic GBC combs. Plastic comb binding is most popular for schools and businesses who need to bind using the most inexpensive consumables, need the ability to bind large documents, and want the ability to custom print on the binding spine. They are affordable, come in many colors and sizes, and we can personalize them with your business information or document labels. With these pre-punched pages, you don't need a punch at all. We stock punched filler paper for GBC combs in 8 ½" W x 11" H letter size. They are a standard white 20# bond copy paper, perfect for filler pages within your book. We also have the option of either a generic brand, or a Hammermill brand paper. 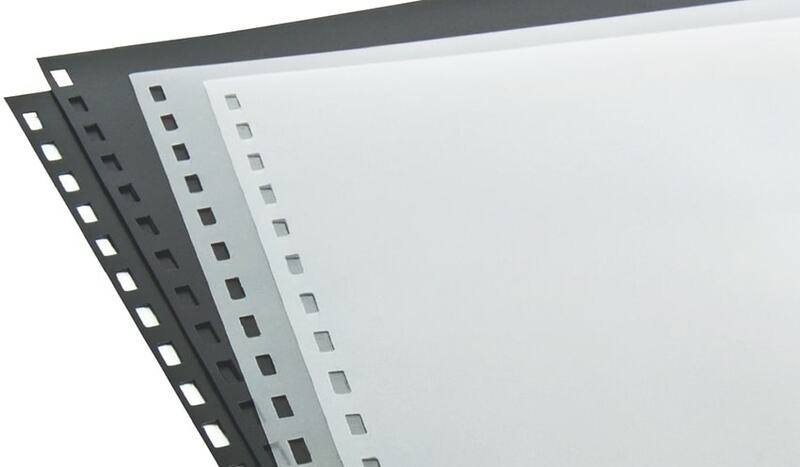 For the punched binding covers, we stock clear acetate options in several different sheet sizes, 5 mil lightweight, 7 mil medium weight, or 10 mil heavyweight options. We also offer punched vinyl cover pages, which are made of a premium leather-like vinyl material that is incredibly popular. To bind the punched pages and covers with plastic comb, you will need a comb opener to spread open the prongs. Once open, place your sheets into the comb, then close the prongs around your book. Spiral-O wire bindings (also called spiral o wire combs) have a special hole spacing that was made to fit perfectly with the same plastic comb 19 hole pattern. Spiral-O wire is a specially made twin loop wire that is designed to allow plastic comb binding users the option to also bind with a more professional-looking wire, without having to buy a whole new binding machine. But with these pre-punched pages, you don't need a punch at all. The same paper and cover options as above are available. To bind the punched pages and covers with spiral-o wires, place the twin loops into the holes and then place the wire into a wire closer. Velo binding is most popular for legal documents, briefs, and contracts. They are most popular in law offices because they are considered semi-permanent, creating a very secure document binding option. Velo binding typically comes in two versions: cold knife, which uses 4 prong binding strips (not secure), or the more common hot knife, which uses 11 prong binding strips (secure). To bind with punched velo pages, you will still need a hot knife binding system to melt the two pieces together, but this paper eliminated the need to punch, eliminating that required step from your process. Our pre-punched velo paper features 11 small holes along the 11" binding edge, and eliminates the need to punch your pages before you bind them in your hot knife velo system. We offer generic or Hammermill brand options, both in a standard 20 # bond copy paper stock. If the above options are not exactly what you are looking for, don't fret - we can custom-punch any of our report covers to meet most document binding patterns. You can call us at (866)537-2244 (866)537-2244 or email info@buy101.com to request a custom punched binding cover price quote, or check out our custom report cover page to see some samples of past custom jobs.